BioBoost promotes utilisation of horticultural residual streams for new products. BioBoost partner Vives therefore is developing new applications including vegetarian burgers. Recently two burgers were developed who not only taste good, but probably will be brought to market also. 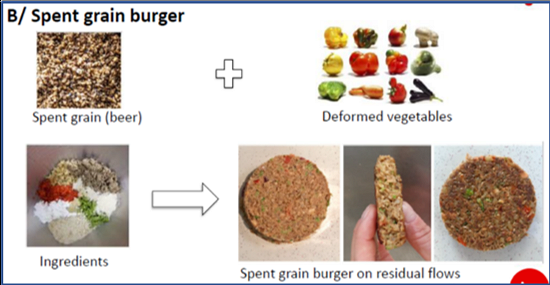 For the new burgers Vives studied two residual streams: green beans and spent brewers grains. Many green beans are rejected because of colour or shape deviations. Also pieces are left over in the processing, for instance parts that are cut off to get beans of the same length. This residual stream is grained and undergoes a number of treatments to get a good burger that tasted great once fried. Spent brewer grains is a residual product of beer brewing. It consists mainly of the outside of the grain and protein parts. Vives has mixed this with other horticultural residual streams such as bell pepper, aubergine and mushrooms and processed to an attractive and tasty burger. It is very special that no egg or breadcrumbs are used for the binding. Therefore the burger can also be eaten by vegans. Several breweries have shown interest to start producing the burger and to sell it as ‘beer’ burgers.